We weren’t supposed to choose favorites. 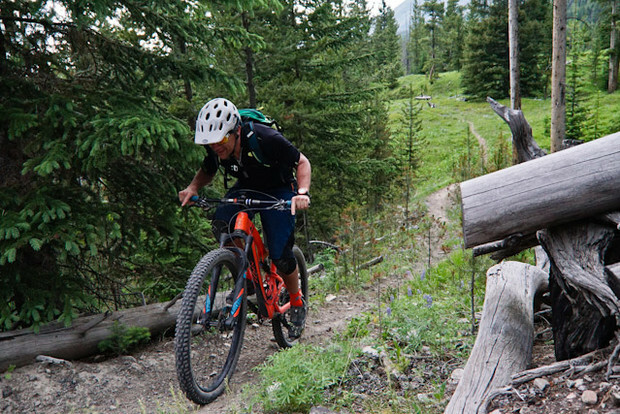 So, the IBIS Ripley is ONE of my favorites from our Big Sky Bike Test and one of the most fun bikes I’ve tested in the last several years. It’s practically a unicorn. 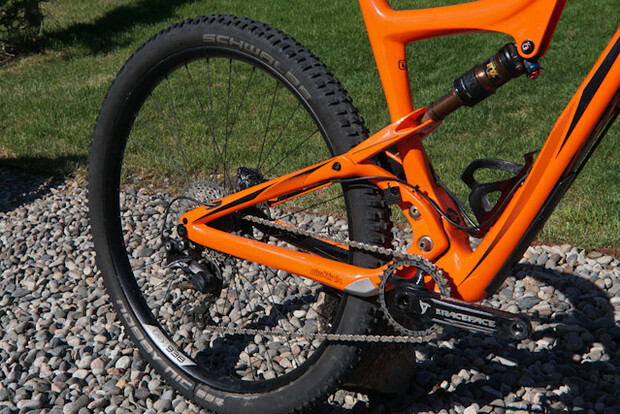 Ibis' dual-eccentric pivot flavor of DW Link suspension pedals and descends with smooth aplomb. DW technology claims their position sensitive anti-squat properties most effectively minimize energy loss and maximizes driving force. The Ripley is definitely the most nimble, playful 29'er I’ve been on. It's efficient, fast and confident at speed. If you ride on trails, and are in the market for a new bike, throw a leg over one. Tang color with a solid build. Ryan Dunfee photo. We were on a very solid XT build, far from their top price point. Which made the way this bike performed all the more special. 34mm internal aluminum Ibis rims came with DT Swiss hubs (usually Ibis wheels have either Ibis or Industry9 hubs, but ours had the DT Swiss 350's with the highest-engaging star ratchet) and Schwalbe Nobby Nic tires. A nicely thought-out blend of Shimano XT, Raceface, Rockshox, Fox and Ibis carbon bespoke rounded out the parts spec. The bike felt built to put a smart, high-performer at every position, not just hit a price-point. Finding sag and getting rolling was really easy for all our test riders. 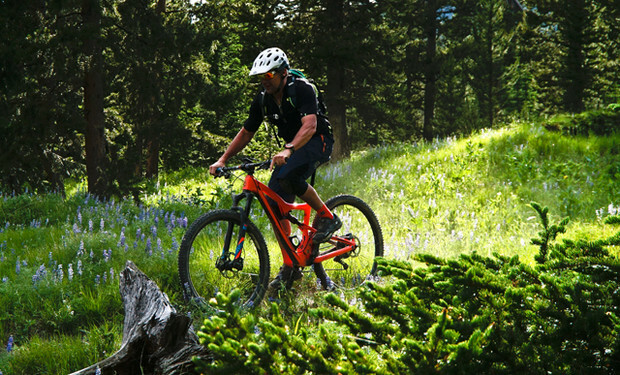 Ibis cycles was founded by Scot Nicol who, if you follow the history of the sport at all, is one of the '80s hippie, Crested Butte, CO/Mendocino, CA beard-wearing founders of mountain biking. He's in the MTB hall of fame group that includes Joe Breeze, Gary Fisher, Charlie Kelley, Steve Potts, Charlie Cunningham—and on and on. For what it's worth, race results from that era show that Scot was even fast among that illustrious crew. Not to mention a world-class trials rider as well. Spend an hour or two reading about the company's history and you'll end up questioning the coolness of your own life choices. For all the common sense and thoughtful touches a small bike company has, Ibis bikes feel like they leverage an A-list R&D/engineering process. But Ibis is NOT owned by Trek, Specialized or Giant. Ibis' bikes come from years of careful consideration, without regard to marketing forces. Cut Ibis no emotional slack and judge them with the best, for that is what they are. Nerp de derp-ing along. Ryan Dunfee photo. Wheels: Ibis 938 very wide aluminum asymmetric (35mm internal). Yours truly going uphill, and smiling. All you really need to know. Ryan Dunfee photo. 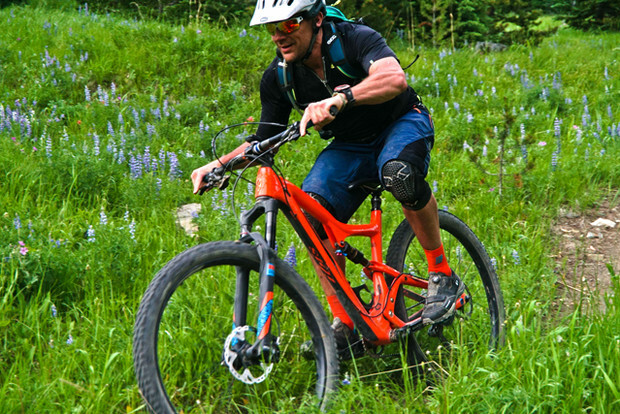 Tester Branham Snyder remarked, “This bike climbs like a rocket.” You can toggle the pedal mode on the Fox Float shock, of course, but he preferred to leave it open for a more comfortable and bump-ready pedaling platform on technical ups. Snyder felt it climbed better than a hardtail because of that bit of give in the rear end. The Ripley conforms to current fashion with a relatively steep 73-degree seat tube angle, ensuring climbing position is forward and over the front wheel. It felt very natural and I didn't have to play around on the saddle to find my balance and power. The bike climbs like a light, stiff racer. But, moreover, there's an airy quality to it. We by no means had the Ripley’s lightest build, but it felt like it. The super-tech looking rear triangle and drivetrain. Ryan Dunfee photo. If you wanted to go crazy you could get Ibis' all carbon-wheel/carbon-crank/SRAM Eagle 'Werx' build and lose a pound or two. I like the tough-as-nails Turbine crank and XT just fine. In terms of the fork, ours came with the Pike, but you could get a Fox Float 34 for the same price. It’s a toss-up. Fox's new Fit4 damper is worth considering. Branham Snyder, straightening the curves, flattening the hills. Someday the mountain might get him, but the law never will. Ryan Dunfee photo. 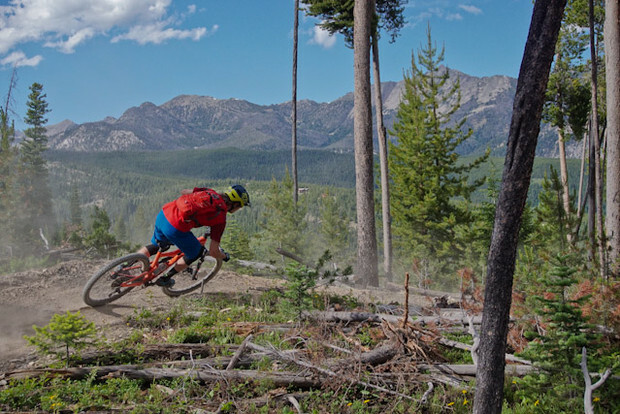 For what it’s worth, Branham won the 2016 Montana Enduro Series Pro Men's overall. So when he says “manual the straightaways, nose bonk stumps and get sideways,” he’s actually doing those things—in a way you stop to watch. I noticed the same thing, albeit without the nose-bonking. While very light, playful and responsive, the bike holds speed very well. You lose little to nothing in the turns due to Ripley’s remarkable edge-to-edge ability. It pumps, shucks and jives so great. If you want to keep the rubber down and hold speed, it’ll accommodate. Walt Pettiford, exceeding the recommended use warning. He probably took the tag off his mattress too. Ryan Dunfee photo. When the going turns old-school technical DH, this, like most 120mm bikes, will be a little out-gunned. But, even so, the Ripley was still remarkably composed and didn't have Branham “resorting to survival tactics.” Again: Branham would probably not resort to survival tactics even if he was blindfolded on a unicycle. The Ripley owns my fastest, and most fun, ride on that trail the whole test week. I just kept pushing it faster and kept having more, and more, and more fun, until I was right on that ragged edge of control, danger and ecstasy. 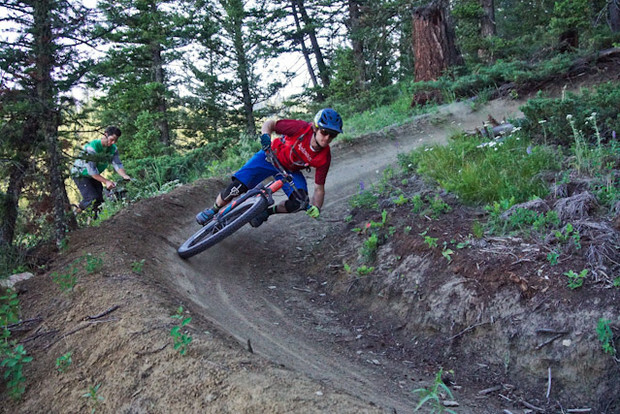 Of course, Big Sky's local riders were so fast and talented I had to push harder than I normally would to keep up. But the bike could handle whatever I did and kept delivering smiles. Montana is a pretty nice overall experience, no matter what bike you're on. 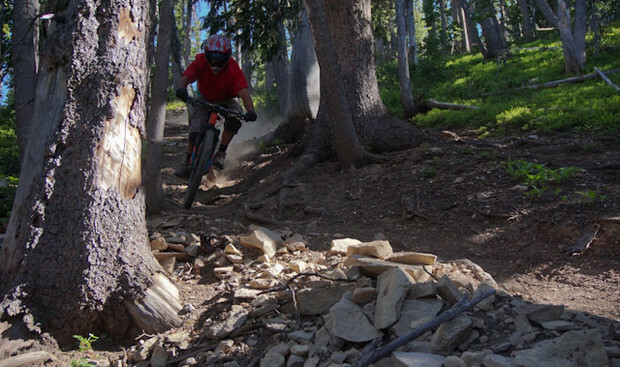 Branham flows down the incredible Mountain To Meadows trail Ryan Dunfee photo. Branham found the bike surprisingly fun to ride, “but it isn't too one-sided and proved to be a very good all-around bike. This is the perfect bike for the rider who wants to put in long miles on adventurous, technical terrain. 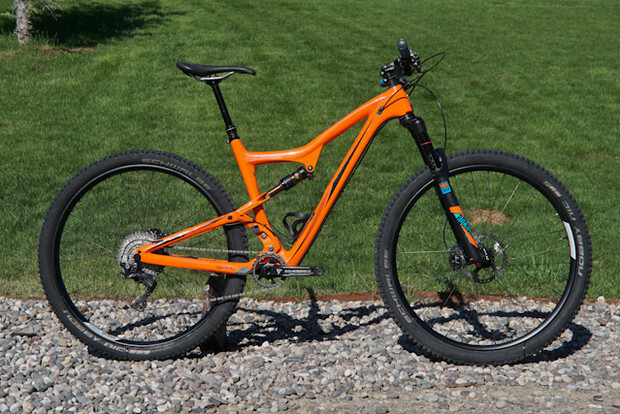 This is the Montana bike—it'll take you on epics up thousands of feet of climbing, but won't leave you disappointed on the descent. " 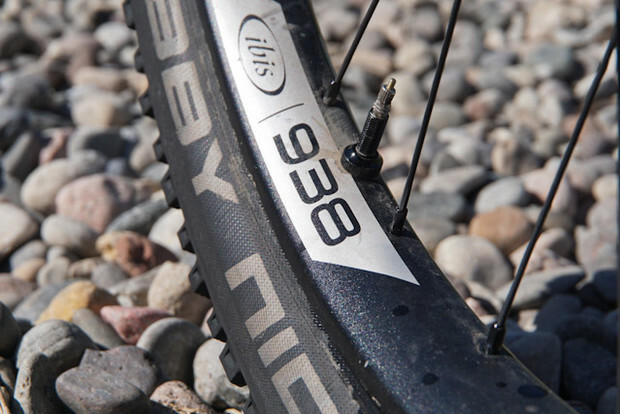 The well thought-out Ibis 938 (35mm internal width) aluminum wheels. Ryan Dunfee photo. I absolutely loved the Ibis wheels; they really hit a winner with those, both aluminum and carbon versions. Scot mentioned that the wheels, mated with Maxxis’ new WT, or any 2.4" or 2.5" tires, really open up a lot of capability on this (or any) bike. We'll be reviewing their wheels separately in another article, but know that even if you spring for alloy instead of carbon, you'll be impressed. #whensocksmatchyourbike, life is good. Ryan Dunfee photo. I’m constantly amazed by the engineering and ability bikes deliver today. With that said, the Ripley sits comfortably in the upper echelons of all current trail super-bikes. The BB is just a hair lower, the reach just a bit shorter than some other A-listers, giving Ripley a playful quality so rarified among 29'ers. The dual eccentric pivots work wonders to decouple pedaling from suspension. If you’re looking for an instantly fun bike, here you go. Great review! Can you comment on the rear tire clearance? Would it be possible to fit a 2.4 or 2.5 on a wide rim like it´s mentioned in the article? Thanks! The grasses are the same as with those at lawn fertilizing Greenwood, IN . Congratulations to all who made it. You are all winners.